The native term guanchinet literally translated means "person of Tenerife" (from Guan = person and Chinet = Tenerife). It was modified, according to Juan Núñez de la Peña, by the Castilians into "Guanchos". 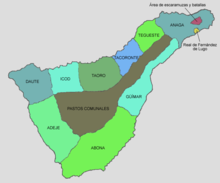 Though etymologically being an ancient, Tenerife-specific, term, the word Guanche is now mostly used to refer to the pre-Hispanic aboriginal inhabitants of the entire archipelago. Roman author and military officer Pliny the Elder, drawing upon the accounts of Juba II, king of Mauretania, stated that a Mauretanian expedition to the islands around 50 BCE found the ruins of great buildings, but otherwise no population to speak of. If this account is accurate, it may suggest that the Guanches were not the only inhabitants, or the first ones; or that the expedition simply did not explore the islands thoroughly. 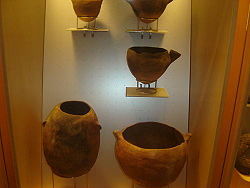 Tenerife, specifically the archaeological site of the Cave of the Guanches in Icod de los Vinos, has provided habitation dates dating back to the 6th century BCE, according to analysis carried out on ceramics that were found inside the cave. Strictly speaking, the Guanches were the indigenous peoples of Tenerife. The population seems to have lived in relative isolation up to the time of the Castilian conquest, around the 14th century (though Genoese, Portuguese, and Castilians may have visited there from the second half of the 8th century onwards). The name came to be applied to the indigenous populations of all the seven Canary Islands, those of Tenerife being the most important or powerful. What remains of their language, Guanche – a few expressions, vocabulary words and the proper names of ancient chieftains still borne by certain families – exhibits positive similarities with the Berber languages. The first reliable account of the Guanche language was provided by the Genoese explorer Nicoloso da Recco in 1341, with a translation of numbers used by the islanders. According to European chroniclers, the Guanches did not possess a system of writing at the time of conquest; the writing system may have fallen into disuse or aspects of it were simply overlooked by the colonizers. Inscriptions, glyphs and rock paintings and carvings are quite abundant throughout the islands. 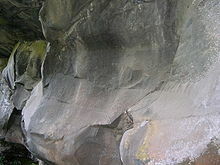 Petroglyphs attributed to various Mediterranean civilizations have been found on some of the islands. In 1752, Domingo Vandewalle, a military governor of Las Palmas, attempted to investigate them, and Aquilino Padron, a priest at Las Palmas, catalogued inscriptions at El Julan, La Candía and La Caleta on El Hierro. In 1878 Dr. René Verneau discovered rock carvings in the ravines of Las Balos that resemble Libyan or Numidian writing dating from the time of Roman occupation or earlier. In other locations, Libyco-Berber script has been identified. The geographic accounts of Pliny the Elder and of Strabo mention the Fortunate Isles but do not report anything about their populations. An account of the Guanche population may have been made around AD 1150 by the Arab geographer Muhammad al-Idrisi in the Nuzhatul Mushtaq, a book he wrote for King Roger II of Sicily, in which al-Idrisi reports a journey in the Atlantic Ocean made by the Mugharrarin ("the adventurers"), a family of Andalusian seafarers from Lisbon. The only surviving version of this book, kept at the Bibliothèque Nationale de France, and first translated by Pierre Amédée Jaubert, reports that, after having reached an area of "sticky and stinking waters", the Mugharrarin moved back and first reached an uninhabited Island (Madeira or Hierro), where they found "a huge quantity of sheep, which its meat was bitter and inedible" and, then, "continued southward" and reached another island where they were soon surrounded by barks and brought to "a village whose inhabitants were often fair haired with long and flaxen hair and the women of a rare beauty". Among the villagers, one did speak Arabic and asked them where they came from. Then the king of the village ordered them to bring them back to the continent where they were surprised to be welcomed by Berbers. Apart from the marvelous and fanciful content of this history, this account would suggest that Guanches had sporadic contacts with populations from the mainland. Al-Idrisi also described the Guanche men as tall and of a reddish-brown complexion. During the 14th century, the Guanches are presumed to have had other contacts with Balearic seafarers from Spain, suggested by the presence of Balearic artifacts found on several of the Canary Islands. Alonso Fernández de Lugo presenting the captured Guanche kings of Tenerife to Ferdinand and Isabella. The Castilian conquest of the Canary Islands began in 1402, with the expedition of Jean de Béthencourt and Gadifer de la Salle to the island of Lanzarote. Gadifer would invade Lanzarote and Fuerteventura with ease since many of the aboriginals, faced with issues of starvation and poor agriculture, would surrender to Spanish rule. The other five islands fought back. El Hierro and the Bimbache population were the next to fall, then La Gomera, Gran Canaria, La Palma and in 1496, Tenerife. In the First Battle of Acentejo (31 May 1494), called La Matanza (the slaughter), Guanches ambushed the Castilians in a valley and killed many. Only one in five of the Castilians survived, including the leader of the expedition, Alonso Fernandez de Lugo. Lugo would return later to the island with the alliance of the kings of the southern part of the island, and defeated the Guanches in the Battle of Aguere. The northern Menceyatos or provinces fell after the Second Battle of Acentejo with the defeat of the successor of Bencomo, Bentor, Mencey of Taoro – what is now the Orotava Valley – in 1496. Genetic evidence shows that northern African peoples (possibly descendants of the Capsian culture) made a significant contribution to the aboriginal population of the Canaries following desertification of the Sahara at some point after 6000 BC. Linguistic evidence suggests ties between the Guanche language and the Berber languages of North Africa, particularly when comparing numeral systems. Research into the genetics of the Guanche population have led to the conclusion that they share an ancestry with Berber peoples. The islands were visited by a number of peoples within recorded history. The Numidians, Phoenicians, and Carthaginians knew of the islands and made frequent visits, including expeditions dispatched from Mogador by Juba. The Romans occupied northern Africa and visited the Canaries between the 1st and 4th centuries AD, judging from Roman artifacts found on and near the island of Lanzarote. These show that Romans did trade with the Canaries, though there is no evidence of them ever settling there. Archaeology of the Canaries seems to reflect diverse levels of technology, some differing from the Neolithic culture that was encountered at the time of conquest. It is thought that the arrival of the aborigines to the archipelago led to the extinction of some big reptiles and insular mammals, for example, the giant lizard Gallotia goliath (which managed to reach up to a meter in length) and Canariomys bravoi, the giant rat of Tenerife. A 2003 genetics research article by Nicole Maca-Meyer et al. published in the European Journal of Human Genetics compared aboriginal Guanche mtDNA (collected from Canarian archaeological sites) to that of today's Canarians and concluded that, "despite the continuous changes suffered by the population (Spanish colonisation, slave trade), aboriginal mtDNA (direct maternal) lineages constitute a considerable proportion (42 – 73%) of the Canarian gene pool. According to this article, both percentages are obtained using two different estimation methods; nevertheless according to the same study the percentage that could be more reliable is the one of 73%. Although the Berbers are the closest identifiable relatives of the Guanches, it is deduced that important human movements (e.g., the Islamic-Arabic conquest of the Berbers) have reshaped Northwest Africa after the migratory wave to the Canary Islands" and the "results support, from a maternal perspective, the supposition that since the end of the 16th century, at least, two-thirds of the Canarian population had an indigenous substrate, as was previously inferred from historical and anthropological data." mtDNA haplogroup U subclade U6b1 is Canarian-specific and is the most common mtDNA haplogroup found in aboriginal Guanche archaeological burial sites. Both the study done by Maca-Meyer et al. (2003) on Tenerife aborigines and the study done by Fregel et al. (2009) on La Palma aborigines found the majority of mt-DNA haplogroups belonging to the Eurasian clades such as H/HV/U*/R. The study done by Maca-Meyer et al. (2003) on Tenerife Aborigines used a total sample of 71 aborigines and found that the frequency of the Cambridge Reference Sequence (CRS) which belongs to the European haplogroup H2a2 was 21.12% of the total sample. Meanwhile, the same study Maca-Meyer et al. (2003) found out that frequencies of haplogroups H/HV/U*/R(-CRS) at 30.98% of the total; also mtDNA haplogroup V was observed at frequencies of 4.23% of the total sample." Y-DNA, or Y-chromosomal, (direct paternal) lineages were not analyzed in this study; however, an earlier study giving the aboriginal y-DNA contribution at 6% was cited by Maca-Meyer et al., but the results were criticized as possibly flawed due to the widespread phylogeography of y-DNA haplogroup E1b1b1b, which may skew determination of the aboriginality versus coloniality of contemporary y-DNA lineages in the Canaries. Regardless, Maca-Meyer et al. states that historical evidence does support the explanation of "strong sexual asymmetry...as a result of a strong bias favoring matings between European males and aboriginal females, and to the important aboriginal male mortality during the Conquest." The genetics thus suggests the native men were sharply reduced in numbers due to the war, large numbers of Spaniard men stayed in the islands and married the local women, the Canarians adopted Spanish names, language, and religion, and in this way, the Canarians were Hispanicized. According to a recent study by Fregel et al. 2009, in spite of the geographic nearness between the Canary Islands and Morocco, the genetic heritage of the Canary islands male lineages, is mainly from European origin. Indeed, nearly 67% of the haplogroups resulting from are Euro–Eurasian (R1a (2.76%), R1b (50.62%), I (9.66%) and G (3.99%)). Unsurprisingly the Spanish conquest brought the genetic base of the current male population of the Canary Islands. Nevertheless, the second most important haplogroup family is from Northern Africa, Near and Middle East. E1b1b (14% including 8.30% of the typical Berber haplogroup E-M81), E1b1a and E1a (1.50%), J (14%) and T (3%) Haplogroups are present at a rate of 33%. Even if a part of these "eastern" haplogroups were introduced by the Spanish too, we can suppose that a good portion of this rate was already there at the time of the conquest. According to this same study the presence of autochthonous North African E-M81 lineages, and also other relatively abundant markers (E-M78 and J-M267) from the same region in the indigenous Guanche population, "strongly points to that area [North Africa] as the most probable origin of the Guanche ancestors". In this study, Fregel et al. estimated that, based on Y-chromosome and mtDNA haplogroup frequencies, the relative female and male indigenous Guanche contributions to the present-day Canary Islands populations was respectively of 41.8% and 16.1%. Autochthonous (E-M81) and prominent (E-M78 and J-M267) Berber Y-chromosome lineages were detected in the indigenous remains, confirming a North West African origin for their ancestors which confirms previous mitochondrial DNA results. An autosomal study in 2011 found an average Northwest African influence of about 17% in Canary Islanders with a wide interindividual variation ranging from 0% to 96%. According to the authors, the substantial Northwest African ancestry found for Canary Islanders supports that, despite the aggressive conquest by the Spanish in the 15th century and the subsequent immigration, genetic footprints of the first settlers of the Canary Islands persist in the current inhabitants. Paralleling mtDNA findings, the largest average Northwest African contribution was found for the samples from La Gomera. A group of researchers from Puerto Rican universities conducted a study of mitochondrial DNA that revealed that the modern population of Puerto Rico has a high genetic component of Taíno and Guanche (especially of the island of Tenerife). This type of Guanche genes have also been detected in the Dominican Republic. According to an international investigation whose results were given in 2017, a small part of the Guanches aborigines had as relatives the first European farmers from Anatolia (present-day Turkey). This data has been discovered thanks to the analysis of the genome which also confirms that the vast majority of Canarian aborigines come from North Africa but were also related to the first European farmers, whose genetics were introduced into Europe from Anatolia through the migrations of farmers during the Neolithic expansion, around 7,000 years ago. Another study in 2018 confirmed that, like the Guanches, both ancient and modern North Africans are also partly related to Anatolia/Europe. Another recent study that took as a reference 400 adult men and women of all the islands, except La Graciosa, and whose intention was to determine the relationships of Canarian genetic diversity with the more frequent complex pathologies in the archipielago, detected that Canarian DNA shows a distinctive genetic, result of a combination of factors as the geographic isolation of the islands, the adaption to the environment of its inhabitants and the historic mixture of the Pre-hispanic population of the archipielago (coming from North Africa), with European and from Sub-Saharan area individuals. Specifically, was estimated that Canarian population is, at an autosomal level, 75% European, 22% North African and 3% Sub-saharan. The native Guanche language is now only known through a few sentences and individual words, supplemented by several placenames. It has been classified by modern linguists as belonging to the Berber branch of the Afroasiatic languages. Recognizable Berber words (particularly with regards to agriculture) and numerous Berber grammatical inflections have been identified within the Guanche language; however there is a large stock of vocabulary that does not bear any resemblance to Berber whatsoever. Guatimac idol in the Archaeological Museum of Puerto de la Cruz (Tenerife). Little is known of the religion of the Guanches. There was a general belief in a supreme being, called Achamán in Tenerife, Acoran in Gran Canaria, Eraoranhan in Hierro, and Abora in La Palma. The women of Hierro worshipped a goddess called Moneiba. According to tradition, the male and female gods lived in mountains, from which they descended to hear the prayers of the people. On other islands, the natives venerated the sun, moon, earth and stars. A belief in an evil spirit was general. The demon of Tenerife was called Guayota and lived at the peak of Teide volcano, which was the hell called Echeyde; in Tenerife and Gran Canaria, the minor demons took the form of wild black woolly dogs called Jucanchas in the first and Tibicenas in the latter, which lived in deep caves of the mountains, emerging at night to attack livestock and human beings. In Tenerife, Magec (god of the Sun) and Chaxiraxi (the goddess mother) were also worshipped. In times of drought, the Guanches drove their flocks to consecrated grounds, where the lambs were separated from their mothers in the belief that their plaintive bleating would melt the heart of the Great Spirit. During the religious feasts, hostilities were held in abeyance, from war to personal quarrels. Idols have been found in the islands, including the Idol of Tara (Museo Canario, Las Palmas de Gran Canaria) and the Guatimac (Museum Archaeological of Puerto de la Cruz in Tenerife). But many more figures have been found in the rest of the archipelago. Most researchers agree that the Guanches performed their worship in the open, under sacred trees such as pine or drago, or near sacred mountains such as Mount Teide, which was believed to be the abode of the devil Guayota. Mount Teide was sacred to the aboriginal Guanches and since 2007 is a World Heritage Site. But sometimes the Guanches also performed worship in caves, as in "Cave of Achbinico" in Tenerife. Until the 20th century, there were in the Canary Islands (especially in northern Tenerife) individuals called "Animeros". They were similar to healers and mystics with a syncretic beliefs combining elements of the Guanche religion and Christianity. As in other countries close to the islands (e.g. marabouts from the Maghreb), the Animeros were considered "persons blessed by God". Achamán The supreme god of the Guanches on the island of Tenerife; he is the father god and creator. Chaxiraxi The native Guanche goddess known as the Sun Mother. Chijoraji A divine child, son of Chaxiraxi. Magec The god of the Sun and the light, and also thought to be one of the principal divinities. Achuguayo God of the moon. It was the duality of the god Magec (god of the sun). Achuhucanac Rain god, identified with the supreme god (Achamán). Guayota The principal malignant deity and Achamán's adversary. Maxios Benevolent minor gods or genies; domestic spirits and guardians of specific places. Tibicenas Demons in the form of black dogs, these were children of Guayota, the malignant deity. Guadameñe or Guañameñe Tenerife spiritual advisers to the Menceyes (Aboriginal kings), who directed the worship. Faykan or Faicán Gran Canaria a spiritual and religious person in charge, who directed the worship. women priestesses dedicated to worship. They took part in some rituals. Kankus Tenerife the priests responsible for the worship of the ancestor spirits and Maxios (minor gods or genies). Beñesmen or Beñesmer was a festival of the agricultural calendar of the Guanches (the Guanche new year) to be held after the gathering of crops devoted to Chaxiraxi (on August 15). In this event the Guanches shared milk, gofio, sheep or goat meat. At the present time, this coincides with the pilgrimage to the Basilica of the Virgin of Candelaria (Patron of Canary Islands). Among the cultural events are significant traces of aboriginal traditions at the holidays and in the current Romería Relief in Güímar (Tenerife) and the lowering of the Rama, in Agaete (Gran Canaria). Mummy of San Andrés, in the Museo de la Naturaleza y el Hombre (Tenerife, Canary Islands). Mummification was practiced throughout the islands and was highly developed on Tenerife in particular. In La Palma, the elderly were left to die alone at their own wish. After bidding their family farewell, they were carried to the sepulchral cave, with nothing but a bowl of milk being left to them. The Guanches embalmed their dead; many mummies have been found in an extreme state of desiccation, each weighing not more than 6 or 7 pounds. Two almost inaccessible caves in a vertical rock by the shore 3 miles from Santa Cruz on Tenerife are said still to contain remains. The process of embalming seems to have varied. In Tenerife and Gran Canaria, the corpse was simply wrapped up in goat and sheep skins, while in other islands a resinous substance was used to preserve the body, which was then placed in a cave difficult to access, or buried under a tumulus. The work of embalming was reserved for a special class, with women tending to female corpses, and men for the male ones. Embalming seems not to have been universal, and bodies were often simply hidden in caves or buried. In the Museo de la Naturaleza y el Hombre (Santa Cruz de Tenerife) mummies of original inhabitants of the Canary Islands are displayed. In 1933, the largest Guanche necropolis of the Canary Islands was found, at Uchova in the municipality of San Miguel de Abona in the south of the island of Tenerife. This cemetery was almost completely looted; it is estimated to have contained between 60 and 74 mummies. Although little is known about this practice among the aboriginals, it has been shown that they performed both animal sacrifices and human sacrifices. In Tenerife during the summer solstice, the Guanches were accustomed to kill livestock and throw them into a fire as an offering to the gods. Bethencourt Alfonso has claimed that goat kids were tied by the legs, alive, to a stake so that they could be heard bleating by the gods. It is likely that animals were also sacrificed on the other islands. As for human sacrifices, in Tenerife it was the custom to throw the Punta de Rasca a living child at sunrise at the summer solstice. Sometimes these children came from all parts of the island, even from remote areas of Punta de Rasca. It follows that it was a common custom of the island. On this island sacrificing other human victims associated with the death of the king, where adult men rushed to the sea are also known. Embalmers who produced the Guanche mummies, also had a habit of throwing into the sea one year after the king's death. Bones of children mixed with lambs and kids were found in Gran Canaria, and in Tenerife amphorae have been found with remains of children inside. This suggests a different kind of ritual infanticide to those who were thrown overboard. 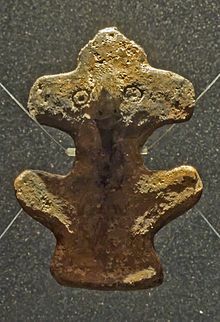 Child sacrifice has been seen in other cultures, especially in the Mediterranean- Carthage (now Tunisia), Ugarit in the current Syria, Cyprus and Crete. Tenerife prior to the Castilian invasion. The political and social institutions of the Guanches varied. In some islands like Gran Canaria, hereditary autocracy by matrilineality prevailed, in others the government was elective. In Tenerife all the land belonged to the kings who leased it to their subjects. In Gran Canaria, suicide was regarded as honourable, and whenever a new king was installed, one of his subjects willingly honoured the occasion by throwing himself over a precipice. In some islands, polyandry was practised; in others they were monogamous. Insult of a woman by an armed man was allegedly a capital offense. Anyone who had been accused of a crime, had to attend a public trial in Tagoror, a public court where those being prosecuted were sentenced after a trial. The island of Tenerife was divided into nine small kingdoms (menceyatos), each ruled by a king or Mencey. The Mencey was the ultimate ruler of the kingdom, and at times, meetings were held between the various kings. When the Castilians invaded the Canary Islands, the southern kingdoms joined the Castilian invaders on the promise of the richer lands of the north; the Castilians betrayed them after ultimately securing victory at the Battles of Aguere and Acentejo. In Tenerife the grand Mencey Tinerfe and his father Sunta governed the unified island, which afterwards was divided into nine kingdoms by the children of Tinerfe. A statue of the Guanche mencey Añaterve. Candelaria, Tenerife. Guanches wore garments made from goat skins or woven from plant fibers called Tamarcos, which have been found in the tombs of Tenerife. They had a taste for ornaments and necklaces of wood, bone and shells, worked in different designs. Beads of baked earth, cylindrical and of all shapes, with smooth or polished surfaces, mostly colored black and red, were fairly common. 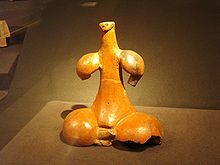 Dr. René Verneau suggested that the objects the Castilians referred to as pintaderas, baked clay seal-shaped objects, were used as vessels for painting the body in various colours. They manufactured rough pottery, mostly without decorations, or ornamented by making fingernail indentations. Guanche weapons adapted to the insular environment (using wood, bone, obsidian and stone as primary materials), with later influences from medieval European weaponry. Basic armaments in several of the islands included javelins of 1 to 2 m in length (known as Banot on Tenerife); round, polished stones; spears; maces (common in Gran Canaria and Tenerife, and known as Magado and Sunta, respectively); and shields (small in Tenerife and human-sized in Gran Canaria, where they were known as Tarja, made of Drago wood and painted with geometric shapes). After the arrival of the Europeans, Guanche nobility from Gran Canaria were known to wield large wooden swords (larger than the European two-handed type) called Magido, which were said to be very effective against both infantrymen and cavalry. Weaponry made of wood was hardened with fire. These armaments were commonly complemented with an obsidian knife known as Tabona. Reconstruction of a Guanche settlement of Tenerife. Dwellings were situated in natural or artificial caves in the mountains. In areas where cave dwellings were not feasible, they built small round houses and, according to the Castilians, practiced crude fortification. Museo de la Naturaleza y el Hombre (Santa Cruz de Tenerife). Museo Canario (Las Palmas de Gran Canaria). Museum of History and Anthropology of Tenerife (Casa Lercaro, San Cristóbal de La Laguna, Tenerife). Archaeological Museum of Puerto de la Cruz (Puerto de la Cruz, Tenerife). In 2001, the Church of the Guanche People (Iglesia del Pueblo Guanche), a Neopagan movement with several hundred followers, was founded in San Cristóbal de La Laguna (Tenerife). Dacil; princess and daughter of mencey Bencomo. She is known as the Pocahontas of the Canary Islands; she was presented to king of Spain with her father and was married to the first Spanish settler. Beneharo (Guanche King in Tenerife). Chisholm, Hugh, ed. (1911). "Guanches" . Encyclopædia Britannica. 12 (11th ed.). Cambridge University Press. pp. 650–651. ^ Conquista y antigüedades de las islas de la Gran Canaria y su descripción, con muchas advertencias de sus privilegios, conquistadores, pobladores y otras particularidades en la muy poderosa isla de Tenerife, dirigido a la milagrosa imagen de Nuestra Señora de Candelaria (in Spanish). ^ Andrew Dalby, Dictionary of Languages, 1998, p. 88 "Guanche, indigenous language of the Canary Islands, is generally thought to have been a Berber language." ^ a b Bynon J., "The contribution of linguistics to history in the field of Berber studies." In: Dalby D, (editor) Language and history in Africa New York: Africana Publishing Corporation, 1970, p 64–77. ^ Hodgkin, Thomas (1848). On the Ancient Inhabitants of the Canary Islands (PDF). Journal of the Ethnological Society. p. 173. Retrieved 16 May 2016. ^ a b c d e Maca-Meyer, Nicole; Arnay, Matilde; Rando, Juan Carlos; Flores, Carlos; González, Ana M; Cabrera, Vicente M; Larruga, José M (2003). "Ancient mtDNA analysis and the origin of the Guanches". European Journal of Human Genetics. 12 (2): 155–62. doi:10.1038/sj.ejhg.5201075. PMID 14508507. ^ Pereira, L; MacAulay, V; Prata, M.J; Amorim, A (2003). "Phylogeny of the mtDNA haplogroup U6. Analysis of the sequences observed in North Africa and Iberia". International Congress Series. 1239: 491. doi:10.1016/S0531-5131(02)00553-8. ^ a b Fregel, Rosa; Gomes, Verónica; Gusmão, Leonor; González, Ana M; Cabrera, Vicente M; Amorim, António; Larruga, Jose M (2009). "Demographic history of Canary Islands male gene-pool: Replacement of native lineages by European". BMC Evolutionary Biology. 9: 181. doi:10.1186/1471-2148-9-181. PMC 2728732. PMID 19650893. ^ Zurita AI, Hernandez A, Sanchez JJ, Cuellas JA (March 2005). "Y-chromosome STR haplotypes in the Canary Islands population (Spain)". Forensic Science International. 148 (2–3): 233–8. doi:10.1016/j.forsciint.2004.05.004. PMID 15639620. ^ Pino-Yanes, María; Corrales, Almudena; Basaldúa, Santiago; Hernández, Alexis; Guerra, Luisa; Villar, Jesús; Flores, Carlos (2011). O'Rourke, Dennis (ed.). "North African Influences and Potential Bias in Case-Control Association Studies in the Spanish Population". PLoS ONE. 6 (3): e18389. doi:10.1371/journal.pone.0018389. PMC 3068190. PMID 21479138. ^ Fregel, Rosa; Pestano, Jose; Arnay, Matilde; Cabrera, Vicente M; Larruga, Jose M; González, Ana M (2009). "The maternal aborigine colonization of La Palma (Canary Islands)". European Journal of Human Genetics. 17 (10): 1314–24. doi:10.1038/ejhg.2009.46. PMC 2986650. PMID 19337312. ^ Bynon J., "The contribution of linguistics to history in the field of Berber studies." In: Dalby D, (editor) Language and history in Africa New York: Africana Publishing Corporation, 1970, p 64-77. ^ Aliño, López-Ibor; Carmen Leal Cercós; Carlos Carbonell Masiá; Janssen-Cilag. Images of Spanish Psychiatry. World Psychiatric Association. Editorial Glosa, S.L. p. 574. ISBN 84-7429-200-X. Maca-Meyer, Nicole; González, Ana M; Pestano, José; Flores, Carlos; Larruga, José M; Cabrera, Vicente M (2003). "Mitochondrial DNA transit between West Asia and North Africa inferred from U6 phylogeography". BMC Genetics. 4: 15. doi:10.1186/1471-2156-4-15. PMC 270091. PMID 14563219. Wikimedia Commons has media related to Guanche.